A faceless laborer lifts what appears to be bales of cotton--presumably one of many for New York's textile and garment industries. The etching's dark, cross-hatched interior contrasts with a view of docks, tugboat, and buildings seen through the doorwary. The anonymous toil depicted here would have been paralleled by sharecroppers in the South, although a market crash there preciptated a "great migration" north. About the Artist: Born in Beijing, China, Grambs was the granddaughter of a Baptist missionary and daughter of what she later termed an “exploitive businessman”; she grew up in Tian-Jing but felt isolated because Europeans didn’t interact with the Chinese. In 1934, she received an Art Students League scholarship that enabled her to emigrate to New York. She was greatly influenced by Harry Sternberg’s printmaking class—how the medium enabled direct confrontation with social injustices—and was active in several Popular Front organizations. As James Wechsler writes, Grambs’ work in printmaking coincided with government support for progressive artists: “Through the FAP, art became an integral part of the New Deal’s objective of treating the intangible symptoms of a demoralized nation...giving visual from to what President Roosevelt called the ‘nameless, unreasoning, unjustified terror which paralyzes needed efforts to convert retreat into advance’” (383-384). Her NDG print “Warehouse, East River” appeared in a 1936 WPA show at the Brooklyn Academy of Music, one of 25 lithographs that she produced for the federal program. Grambs was deeply involved with the Artists’ Union and its efforts to preserve public funding for the arts amidst conservative reaction. 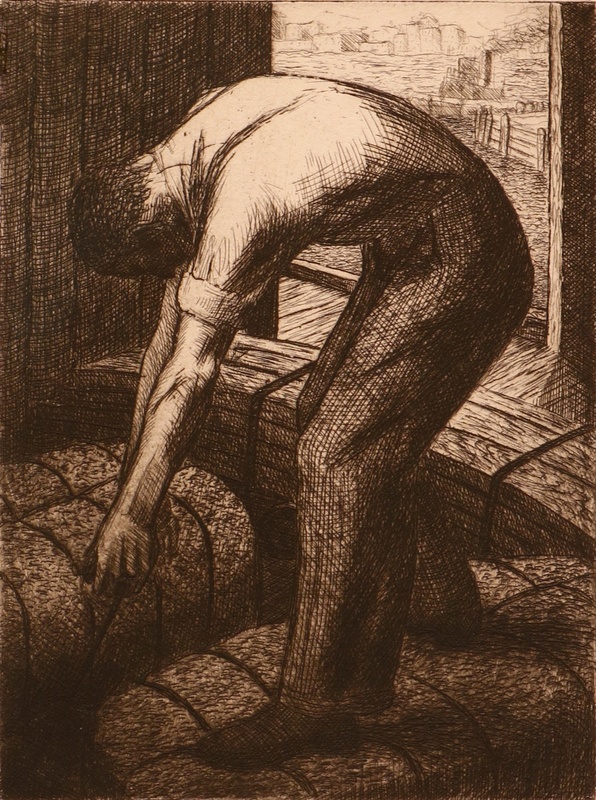 In 1936, her former teacher Sternberg arranged for a group of artists to visit the minefields of Pennsylvania; many of her most powerful prints date to this period, showing the intersectionality of labor and ecological exploitation. She relocated to Europe briefly in 1939 but returned via a harrowing journey as borders closed. Grambs never worked in printmaking again, making her living initially as an illustrator for Woman’s Day magazine and eventually for more than 30 children’s books (sometimes under the name Grambs Miller). Many of these books evoked an affirmative vision of nature (a far cry from the Pennsylvania coal fields) that was perhaps influenced by Rachel Carson and an emergent environmental movment: Hummingbirds in the Garden (1969) Mushrooms and Molds (1972); The Young Grizzly; Plant Fun (1974); and Roots are Food Finders (1975). 15 works at National Gallery of Art. 8 works at Smithsonian American Art Museum. 16 works at Metropolitan Museum of Art. 9 works at the Newark Museum. 4 more images at FAP. Sources consulted: James Wechsler, “The Great Depression and the Prints of Blanche Grambs,” Print Quarterly 13.4 (Dec. 1996): 376-396. Grambs, Blanche Mary, 1916-2010, “Warehouse, East River,” OpenValley, accessed April 22, 2019, https://openvalley.org/items/show/997.